During the week May 26th, NYC saw 254 condominium and cooperative sales, averaging $2.3M and $1.5M a sale respectively. The three most expensive closings were on the UES and in Nolita. Egyptian billionaire Nassef Sawiris made history with his $70M penthouse buy – the most ever paid for a co-op. 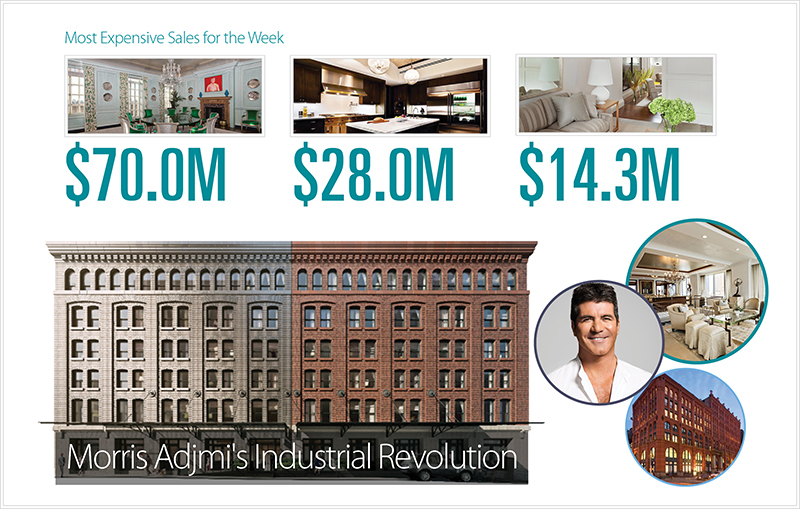 In celeb real estate news, new-age author and physician Deepak Chopra ditched his mediocre Park Imperial pad and even managed to make more than a million dollars in the process; Simon Cowell on the other hand put down $10.85M for his family’s new ultra-luxe UES home. Industrial Revolution: While designers (and developers) are favoring ridiculously tall glass towers, architect Morris Adjmi is returning to the fundamentals by designing subtly distinct, timeless buildings that blend seamlessly into their historic neighborhoods. We profile Adjmi in this week’s issue. For market trends, top residential sales, celeb real estate news and a look at those (architects) who dare to be different, we turn to CityRealty‘s Weekly Market Snapshot for the scoop.